The White Rose or Iceberg Floribunda Rose is beautiful when in full blossom such as this one tended to at the Montreal Botanical Garden in Montreal, Quebec. An insect has stopped for a break on one of the rose petals before continuing on its adventure. A white rose represents innocence, purity and youth and many people buy these types of roses for people in which they respect and admire. These rose bushes grow beautifully with continuous blooms and less diseases than other types of rose bushes, the one downfall to the White Rose is it lacks in aroma. 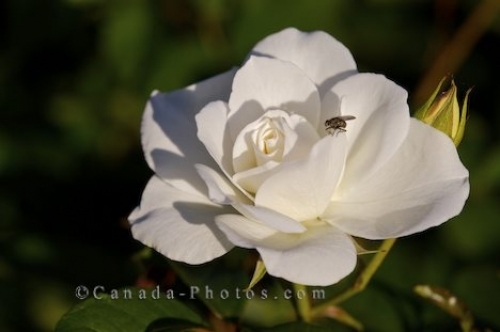 Picture of a small insect sitting on the petal of a beautiful white rose at the Montreal Botanical Garden in Quebec.